However, music wasn’t just a fun hobby for Albara. It was a refuge, as he discovered that music expresses his emotions the most. In his late-teens, Albara traveled abroad to the UK and though he was away from his hometown family, and friends, he found comfort & peace in music. He was determined to learn how to play the Oud but could not find an Arabic music teacher abroad. This was not enough to stopAlbara's passion for music and he started the journey by self-learning. 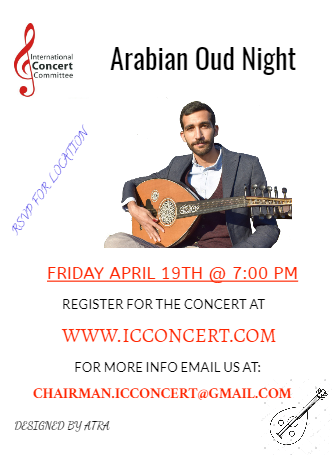 By his early twenties he came back to Saudi Arabia where he continued to hone his music skills and studying the Oud in the Bahrain Music Institute under the Oud master Saad Mahmoud Jawed. There he was also lucky to meet the great teacher Zain Al-Marhabi who gave special attention in developing Albara’s musical skills. Albara is now a part of many Arabic music groups and he is continuing his dream to master, document and preserve the traditional musical styles of his country. The ICC is pleased to bring you the fabulous Albara. When: April the 19th @ 7:00 pm. Where: A location map will be sent to you after registering for the concert. Tickets are 100 SR for an adult and 50 SR for a child between the ages of 5 and 16.